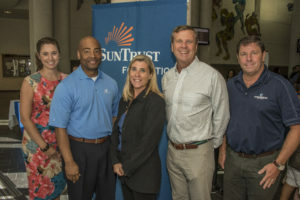 The SunTrust Foundation, in partnership with Autism Speaks, hosted a free financial planning workshop in August at the University of Central Florida. The workshop was designed to help people with disabilities and their families secure their future by bringing them together with financial experts and service providers in a collaborative atmosphere. The event attracted more than 150 people and consisted of a resource fair, complete with representatives from local nonprofit organizations and local service providers, as well as an introduction to special needs planning by Reilly Morrison, specialty trust advisor at SunTrust Bank.